Batter puddings have a long history throughout Britain. 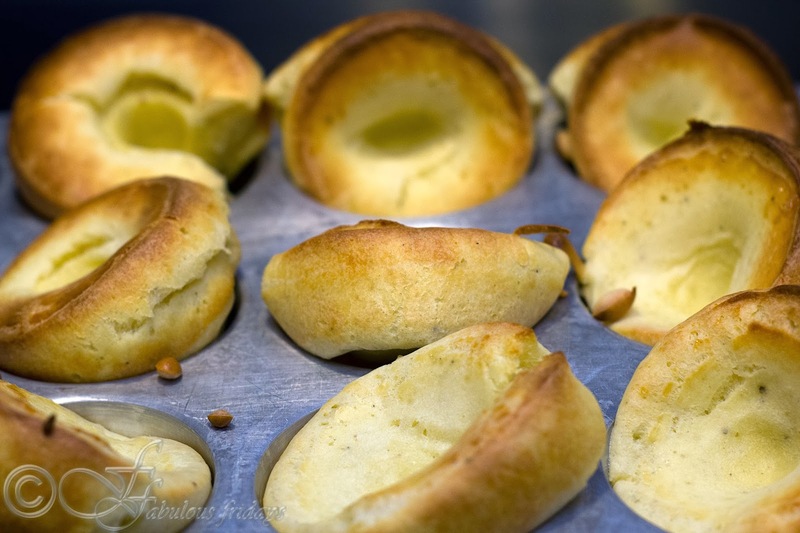 Out of these Yorkshire puddings is decidedly very popular all over the UK. You will see these listed on the menu in a pub or restaurant. 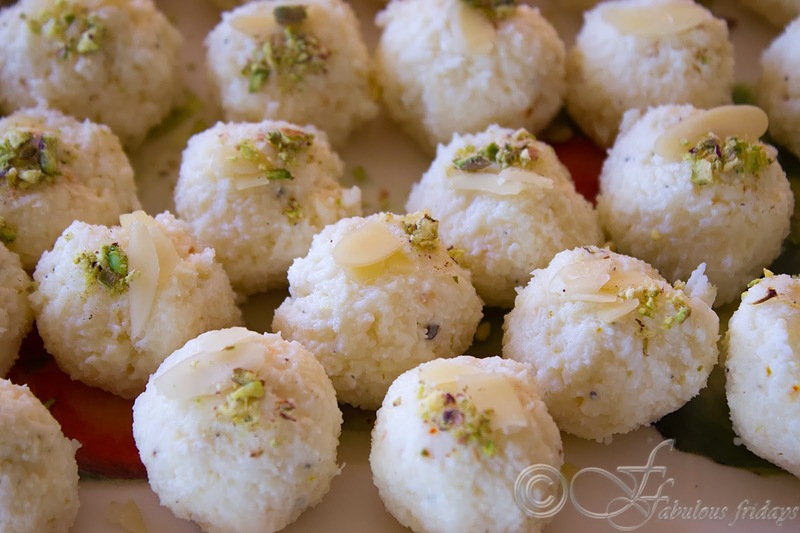 It is a light batter made of eggs, flour and milk that rises when baked. In pubs, you will see large ones that rise at the edges to form a sort of bowl. These can be filled with anything from sausages and beans, to soup or stew, even sweet. Traditionally, smaller Yorkshire puds are served with roast beef, as an accompaniment with horseradish sauce and onion gravy, roast spuds, and veggies. I had an opportunity to try these in London last summer where a Yorkshire pudding bowl was served filled with Faggots in gravy. What are faggots you ask? Well, these are old-fashioned meatballs, traditionally made from pork. Birmingham and the Midlands are considered the home of Faggots in Britain, but with the revival of Faggots, they are now eaten all over the UK. 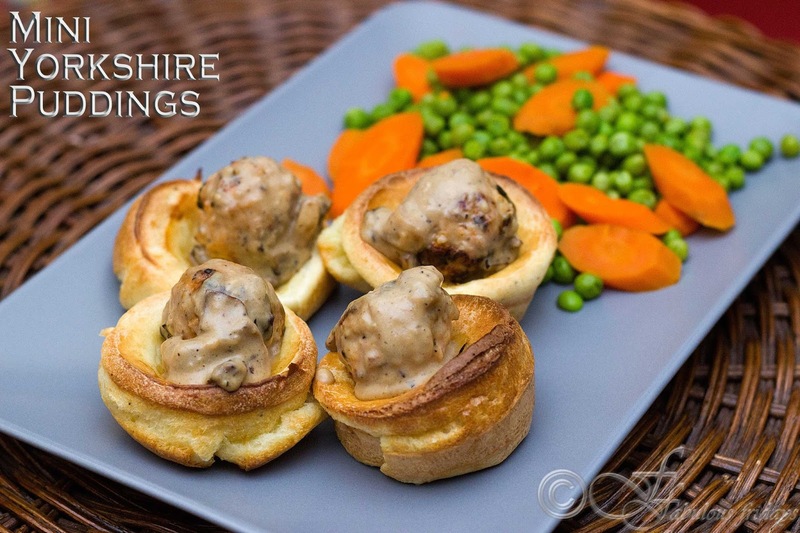 I served these mini Yorkshire puds with lamb meatballs dipped in the mushroom sauce alongside mushy peas and carrots. You can use any meat you like for the faggots and use any gravy you fancy. The single most important thing to remember about these is that the fat must be sizzling hot before you begin cooking and never get tempted to open the oven door in the middle of cooking or you will get flat puddings. Mix all the ingredients well in a small jug to make a smooth batter. Season with salt and cracked black pepper. Leave it at room temperature for a minimum of 15 minutes. When all other parts of your dinner are almost ready, preheat the oven to 475°F. Spray the muffin tin liberally with vegetable oil and put this in the oven as well (10 minutes). The oil and the container should be smoking hot before adding the batter. When hot carefully remove the muffin tin and ladle in the batter, evenly dividing into the 12 muffin cups. If the batter doesn't sizzle when you add the first spoonful, then put the tin back into the oven till it does. Cook the Yorkies for 15-20 minutes till well risen and golden. Keep an eye on them towards the end of cooking time and don't be tempted to open the oven door until they turn golden because as soon as you take them out they will start to sink. Remove from oven and transfer on to a platter. Working quickly fill them with the faggots and mushroom sauce (recipe below) and serve immediately. 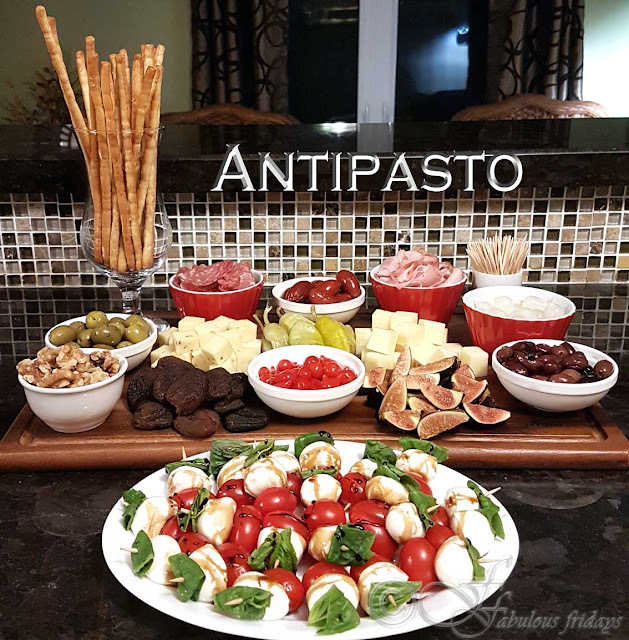 This is not the traditional faggots recipe. I made regular meatballs using lamb and flavoring it the way I like. Mix all the ingredients together until well blended. Shape them into small balls. Place them on a greased cookie sheet and bake for 20-30 minutes till brown and cooked through. Melt butter in a pan over medium heat. Add sliced mushrooms and let them cook without disturbing at high heat for 2-3 minutes till they brown on one side. Turn over, add grated garlic and repeat. When perfectly brown add 1 tsp flour and reduce heat. Cook stirring for 30-40 seconds to roast the flour without browning it too much. Now add the warm milk while vigorously stirring to avoid forming any lumps. Make a smooth sauce. 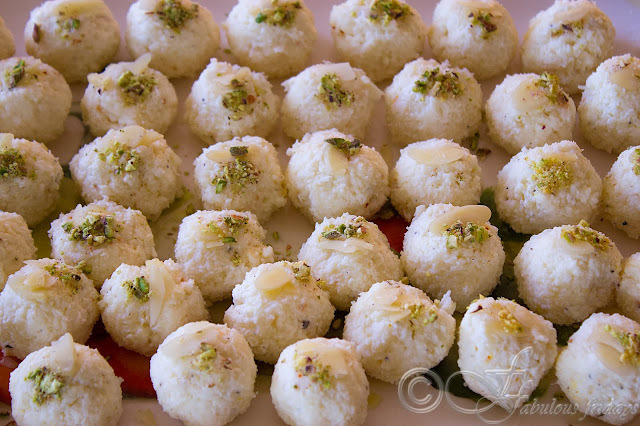 Bring to a gentle boil and adjust the consistency by boiling off excess if thin or adding more milk if too thick. Take off the heat and season with salt, cracked black pepper, and nutmeg. Add the prepared meatballs to the sauce and fold to combine. Serve over the Yorkshire puddings. One of the biggest diet fads emerging in the last two years is the Gluten free diet. Time labeled it as #2 top 10 trends of 2012. Numerous cookbooks have gluten-free recipes, consumers have a choice to order gluten free pizzas, wedding cakes, donuts, and the list goes on. With its popularity soaring, gluten free food isn't just for health food stores anymore. Stores like Walmart, Domino's, Target are carrying several G-free foods and capitalizing on this growing trend. Eating a gluten-free diet helps people with Celiac disease and those with gluten sensitivity control their signs and symptoms and prevent complications. But what about people without Celiac disease or gluten sensitivity that go gluten free to loose weight or get more energy? Research shows that going gluten free has a harmful effect to the good bacteria in our gut. It alters the gut flora and allows bad bacteria to grow. So I guess a middle ground makes for a more healthy alternative for us who want to just limit our gluten intake. In most Indian households, roti dominates as the staple and is the hardest thing to change for a lot of people. In my quest to come up with a low gluten roti I have been experimenting on a number of gluten free and low gluten flours available in the market. In the list below all flours are gluten free except oatmeal and barley which have a low gluten content. All the ingredients are packed with vitamins and are high in protein content. 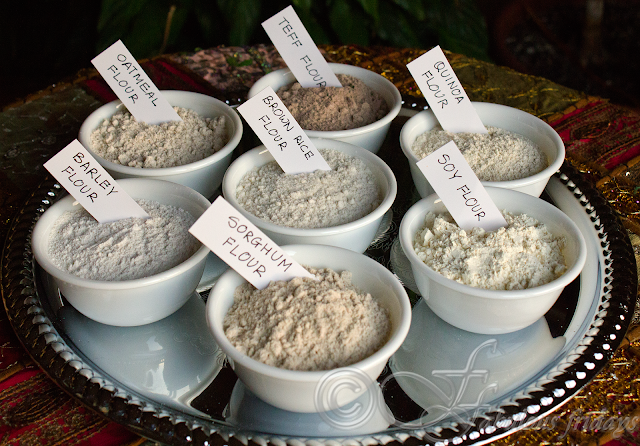 Feel free to alter the flour ratios as per your taste. Mix all the ingredients and make a stiff dough using as little water as possible. The greens usually have a high water content so keep that in mind. 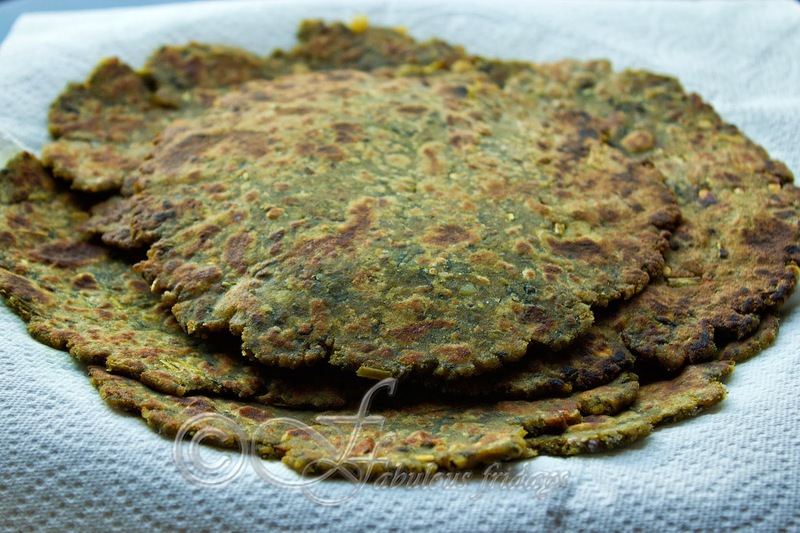 You can add salt and other spices if you plan to eat these as parathas. If you are making these as rotis for a meal accompaniment then omit salt. Divide the dough into 8-10 balls. Using dry flour roll carefully into 6-7 inch diameter. 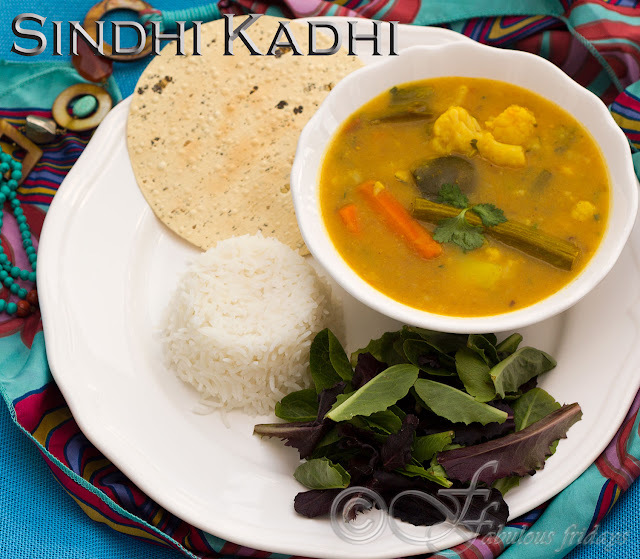 Cook on a hot tava till light brown spots appear and roti is cooked through. Use oil if you are making parathas. 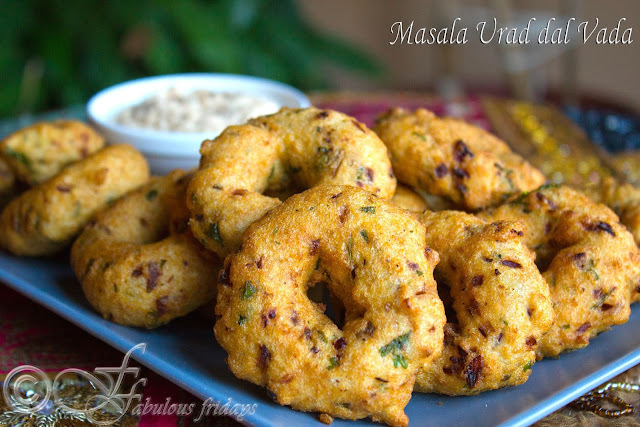 Vadas can be made with any variety of dal - Arhar, Chana, Moong, Urad, or even potato, sabudana. Veggies such as cabbage, spinach, carrots, onion, can be added to increase its nutritive value. Add green chilies, ginger, coconut and /or peanut to enhance flavor. 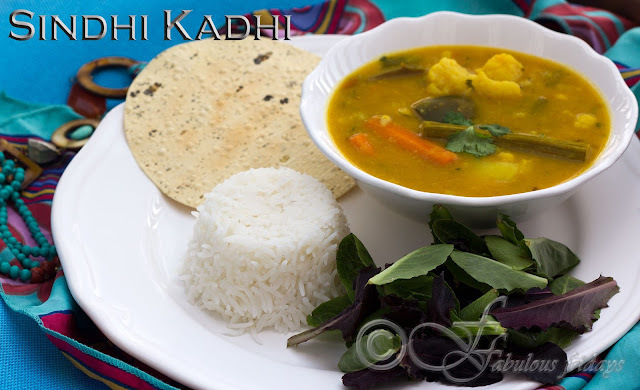 Serve as an appetizer or as lunch with coconut chutney and sambhar. These freeze very well. Reheat them in the oven to crisp up. Grind coarsely using minimum water. Beat the batter well till a small dollop dropped in a bowl of water floats (not sink). Heat oil in a heavy-bottomed pan to medium. Wet your palm with water, take a tablespoon of batter and flatten to form a circle. Make a thumb impression in the center to make a hole. Gently lower it in the hot oil. Fry on medium till golden and crisp on the outside and fully cooked on the inside.